Brains are something of a funny food. They’re the mildest, softest, plainest of all organ meats, yet they’re loaded with a grocery cart full of social taboos. But brains endure, and still show up in markets and butcher shops for those who taste still strays into the grey matter. Most old cookbooks have a few recipes for brains, and you can be sure any good, thick French cookbook worth its salt will have several. 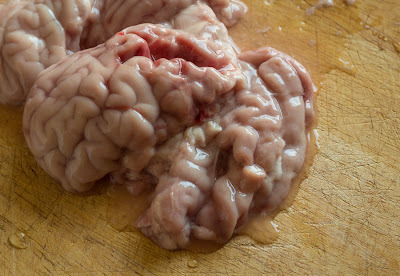 No matter how you’re going to cook the brains, the process is pretty straight-forward; soak overnight in water to leach out any blood pockets, then poach. Poaching firms the brains up so they’re easier to handle, plus you can then peel off the harmless-but-bothersome outer membrane. From there brains can be breaded and fried, sautéed, or poached to completion. Looking at these soft, pale little folds, I imagined cooks everywhere serving brains with their traditional herbs and native spices. Thinking about my own heritage, I knew I had a whole catalog of brain recipes on my father’s French side. So I decided to go a different route and cook the brains with the flavors on my mother’s side; Poland and Lithuania. Swapping out French béchamel, white wine, pearl onions, and chervil, I picked out some sour cream, mushrooms, and dill. While the brains cooled from their poaching, I sautéed white mushrooms in butter, slowing cooking them until the butter browned. Then I added knobs of chopped brain to the pan, tossing them with the browned butter and mushrooms. Taking the pan off the heat, I mixed in a bit of sour cream to bind everything into a loose sauce. A bit of minced dill and I was good to go! Served on toast, the brains were simple and delicious. Each bite was like a custardy cloud of mild, well-behaved flavor. There was no sharp liverish flavor or the barnyard taint of boiled tripe. 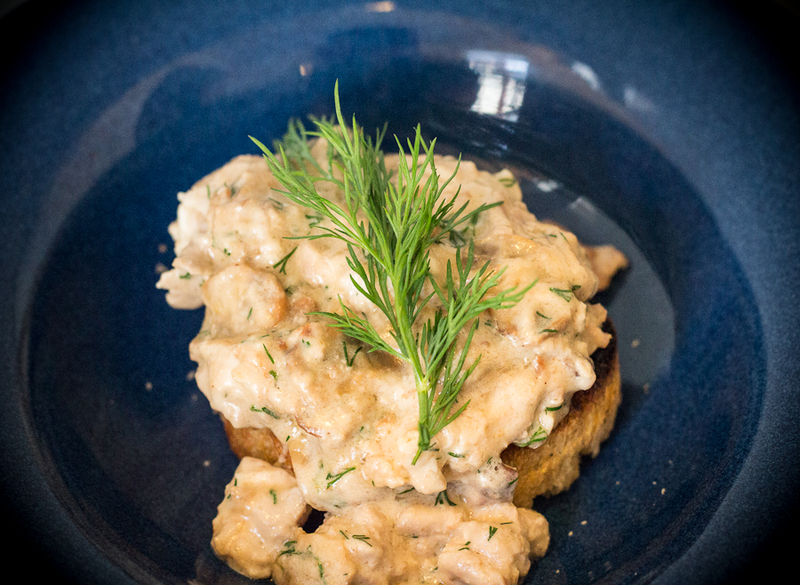 The brains were modest and delicate, with a rich creamy sauce adding to the fattiness of the brains, slightly cut with the bright flavor of dill, and finishing with the warm, nutty taste of savory brown butter. Should you need a respite from all that custardy richness, there’s the bread on the bottom, adding a toasty crunch to the mix.